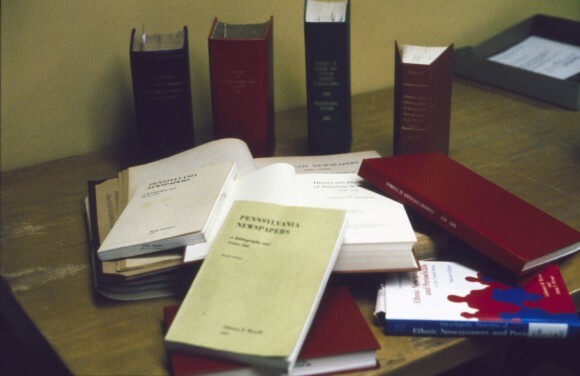 The following is a listing of the “Tools of the Trade” used by the Project Team (Becky and Sue) to research the newspaper publishing history prior to canvassing a county, 1985-1988, and does not represent a comprehensive bibliography on the topic. American Newspapers, 1821-1936: A Union List of Files Available in the United States and Canada. Edited by Winifred Gregory. New York: H.W. Wilson Co., 1937. Arndt, Karl J. R. and Mary E. Olson. German-American Newspapers and Periodicals, 1732-1955. Heidelberg, Germany: Quelle and Meyer Pubs., 1961. 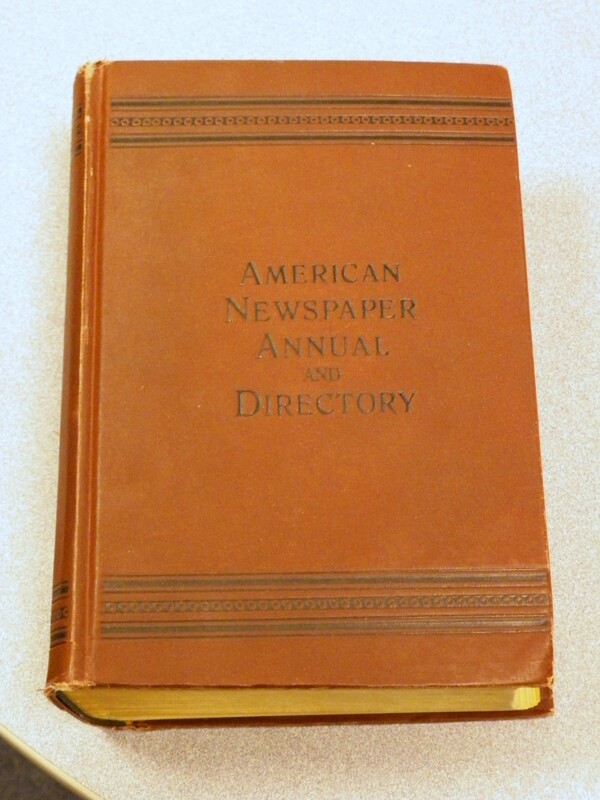 N. W. Ayer and Son’s American Newspaper Annual and Directory. Philadelphia, PA: N.W. Ayer and Son, 1869- . Ayer’s and earlier title Rowell’s are also available online. 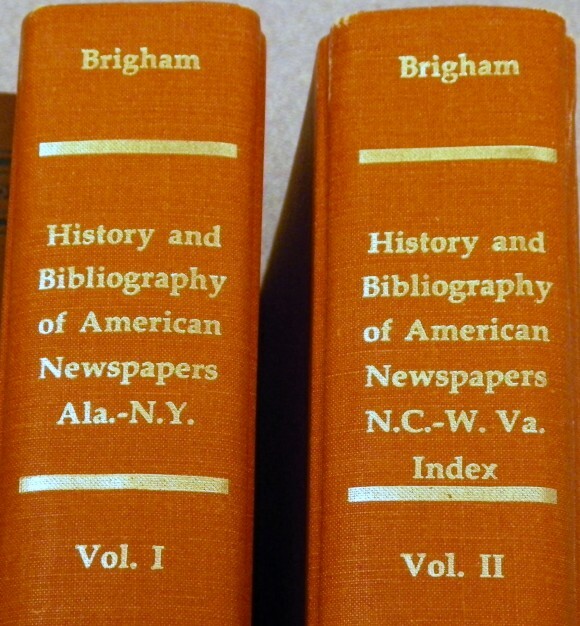 Brigham, Clarence S. History and Bibliography of American Newspapers, 1690-1820. Worcester, Mass. ; American Antiquarian Society, 1947. 1961. Carter, Ruth C. United States Newspaper Program: Cataloging Aspects. New York: Haworth Press, 1986. [Also published in: Cataloging & Classification Quarterly, 6(4) Summer 1986]. Kellerman, L. S. and R. Wilson. Index to the Readex Microfilm Collection of Early American Newspapers. New Canaan, CT: Readex Corp., 1990. Kellerman, L. S. and R. Wilson. Index to the Readex Microopaque Collection of Early American Newspapers. Harrisburg, Pa.: State Library of Pennsylvania, 1990. Lubomyr, Wynar. Encyclopedia Directory of Ethnic Newspapers and Periodicals in the United States. Littleton, Colo.: Libraries Unlimited, 1976. Newton, Craig A., Ed. 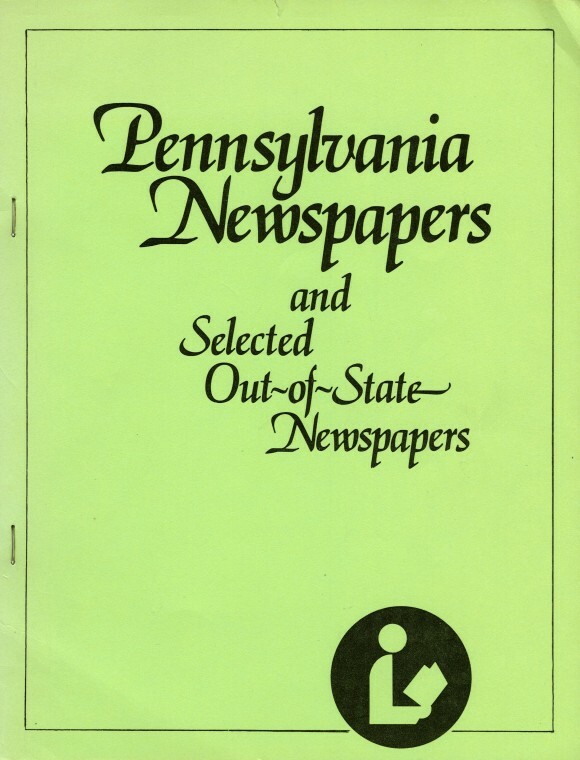 A Checklist of Newspapers Available in and for the Counties of Columbia, Montour, Luzerne, Northumberland, Lycoming, Schuylkill and Sullivan Pennsylvania. Bloomsburg, Pa.: The Columbia County Historical Society, 1972. Pennsylvania Manual. Harrisburg, Pa.: Bureau of Publications, 1923-24. Pennsylvania. State Library. 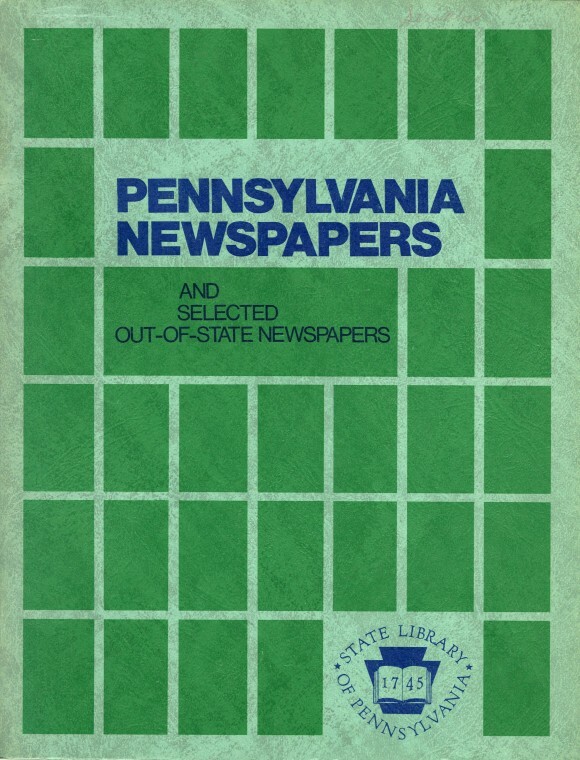 Holdings of Pennsylvania Newspapers. Harrisburg, Pa., 1965. Pennsylvania. State Library. Pennsylvania Newspapers and Selected Out-of-State Newspapers. Harrisburg, Pa., 1976. Pennsylvania State University. Library. Newspapers in Microform. Pattee Library, The Pennsylvania State University. University Park, Pa.: The Library, 1978. Rauco, Louis F. Pennsylvania Newspapers and Selected Out-of-State Newspapers. State Library of Pennsylvania, Library Services Division. Harrisburg, Pa., 1984. Rauco, Louis. Newspapers Currently Received in the State Library. State Library of Pennsylvania. Library Services Division. Harrisburg, Pa., May 1981. Rauco, Louis. Newspapers Currently Received in the State Library. State Library of Pennsylvania. Library Services Division. Harrisburg, Pa., June 1984. Rossell, Glenora E., Ed. Pennsylvania Newspapers: A Bibliography and Union List. 2nd ed. 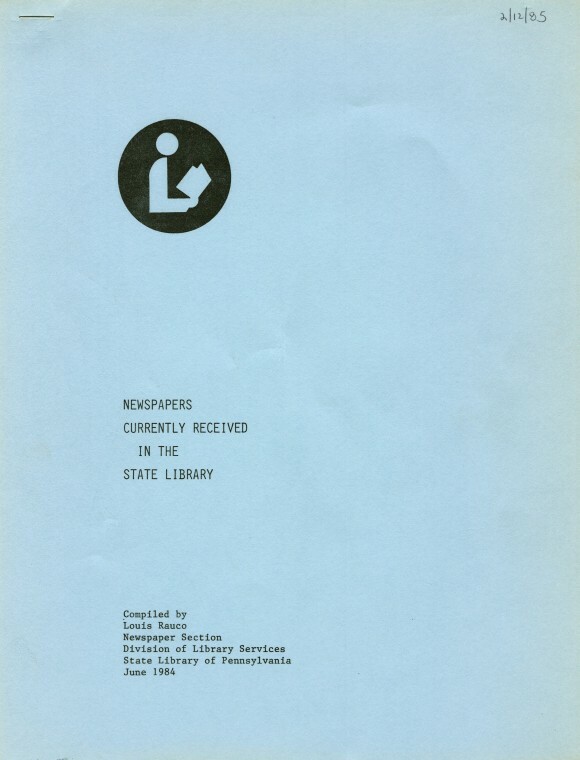 Pittsburgh, Pa.: Pennsylvania Library Association, 1978. Salisbury, Ruth, Ed. 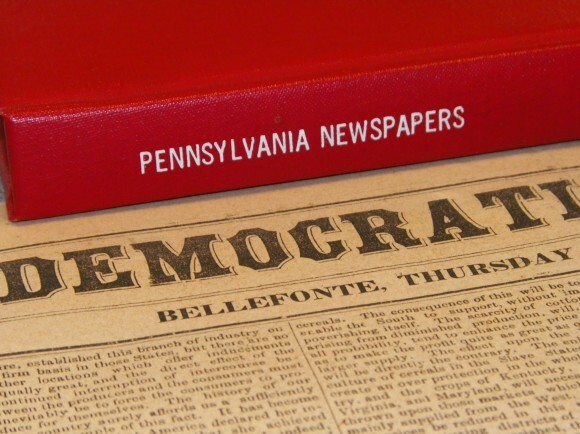 Pennsylvania Newspapers: A Bibliography and Union List. 1st ed. Pittsburgh, Pa.: Pennsylvania Library Association, 1969. United States. Library of Congress. Catalog Publication Division. Newspapers in Microform. Washington, D.C.: Library of Congress, 1948 – . United States Newspaper Program National Union List [microform]: June 1989. 3rd. ed. OCLC Online Computer Library Center, 1989. Beidler, Jim. ” Roots and Branches: Today’s newspaper accessibility began with ’80s project”, online column from the Lebanon Daily News, July 18, 2013. http://www.ldnews.com/columns/ci_23684925/roots-branches-todays-newspaper-accessibility-began-80s-project?IADID=Search-www.ldnews.com-www.ldnews.com (accessed July 22, 2013). Greene, Nancy S. “Library Automation in Transit,” Small Computers in Libraries. October 1987. Vol. 7, no. 9, p. 21-25. 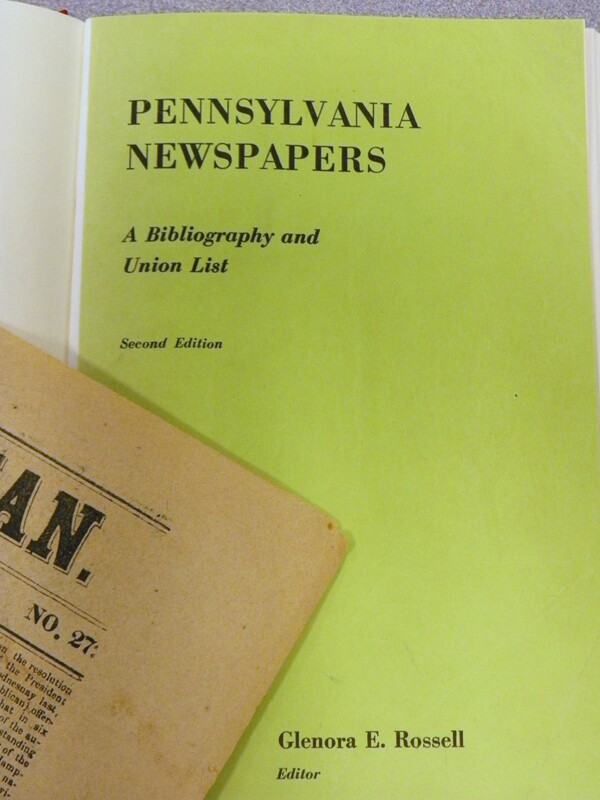 Hoffman, David R. “The Pennsylvania Newspaper Project: Initial Stages.” Serials Librarian. Spring 1986. Vol. 10, no. 3, p. 69-76. Lee, Joan Elaine. Centre County, Pennsylvania: A Bibliography and Guide to Sources of Information. University Park, Pa.: The Pennsylvania State University Libraries, 1980.